There’s some crazy meat industry propaganda video waiting to be made where an All-American jock takes a bite out of a hamburger served by a polite waiter, who then rips off a mask to reveal the demented face of someone from the mushroom industry shouting “that burger is 50 percent mushrooms,” after which the customer drops the burger in horror, and dies. If you make this video, please send it to me. Anyway, by this point, “meat is bad” is a view held by numerous folks in science, health, and tech. Whether or not you agree, scientists are pressing forward with alternatives that still convince the consumer that they’re eating a one hundred percent grade-A mutilated carcass. You’re probably aware of groups pursuing plant-based meat substitutes, or those growing meat from culture. But one (mushroom industry-funded) group of researchers, thinking mainly about meat’s nutrition, is wondering whether they can replace just some of the beef, in this case with mushrooms. And the meat-mush hybrid reportedly turned out pretty similar to the real thing: “Results showed that a formulation containing up to 45% mushrooms can be integrated into beef fillings using un-blanched, white button mushrooms with small grind (1 to 5 mm), which maximized mushroom usage while minimizing differences from the all-meat control,” the University of Massachusetts team wrote in a paper published today in the Journal of Food Science. But what do the tasters think? The researchers performed tests on groups of students. They first found that, out of 159 students, 83 preferred the control while 76 preferred the mushroom formulation (though did not mention in the study whether participants knew which sample they were getting or not). In another trial, the researchers compared a high salt and low salt version of the mushroom meat mix, and found that 100 preferred the low-salt, while 55 preferred the regular amount of salt. It turns out the umami flavor from the mushroom’s MSG could have made up for the salt, and allowed the researchers to create a lower-sodium, still tasty taco beef-mushroom hybrid. There are reasons to be skeptical. This is just one study, and the tasters in both trials were all in their teens or twenties; who knows how this might have affected the results. Additionally, the study was funded by the US Mushroom Council and Australian Mushroom Growers Association which could introduce bias, since industry groups have desired outcomes in research (although as I’ve written in the past, that’s frequently just the way food science goes). I’ve reached out to other experts for further comment. 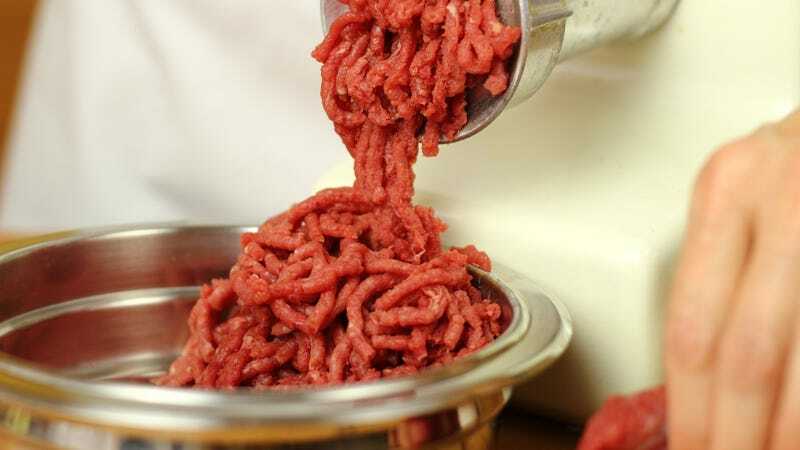 But more importantly, other research has called into question how bad salt and fat actually are for our health, yet these were the main motivations behind the new study’s attempt to replace beef with mushrooms. At least one 2011 meta-analyses, or review of other reviews, found “no strong evidence that cutting salt intake reduces the risk for heart attacks, strokes or death in people with normal or high blood pressure,” as reported by Melinda Wenner Moyer for Scientific American. Reviews have even cast doubt on saturated fat’s role in poor health. Health aside, there are other reasons to cut down on processed meat, such as greenhouse gases emitted by cattle, or the overhyped but still present potential risk for certain cancers, and generally researchers recommend cutting meat down to 70g (2.5 ounces) or less per day. It’s certainly unclear what the future of meat might look like, but just know you will continue to see scientists work really hard to make things that are not cows look, taste, and bleed like cows.